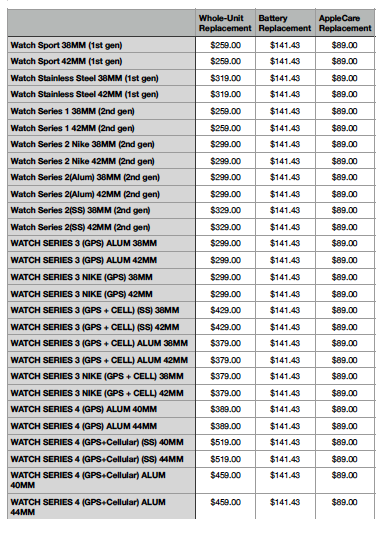 Below is a list of services offered and an idea of prices. Please note these are subject to change without notice and used as a guideline rather than a firm quote. Our Apple certified technicians can attempt to recover your data. This may not always be possible depending on the condition of the device. Jump+ has partnered with forensic data recovery companies, and we are happy to send your device out for diagnostics for forensic recovery. If your Apple product has AppleCare or AppleCare+, we are able to provide the same level of service and extend Apple's terms and conditions. For eligibility, click here: https://www.apple.com/ca/support/13-inch-macbook-pro-solid-state-drive-service-program/. While we welcome walk ins and will do our best to accommodate service as fast as possible, we highly recommend booking an appointment. This will allow us to plan to have service staff ready to assist you, discover what services or parts you may need and be ready for your visit, thereby making better use of your time. Please let us know you’re here for an appointment for your device, and we will connect you to the technician that will be assisting you. Our Apple certified technicians will examine your iPhone and determine if it needs repair or replacement. Most screen repairs are caused by accidental damage, which isn’t covered under the Apple warranty. If your screen cracks due to a manufacturing defect, it’s covered by the Apple warranty. If you have AppleCare+, it includes two incidents of accidental damage coverage. Each incident has a service fee that you can apply towards screen repair. 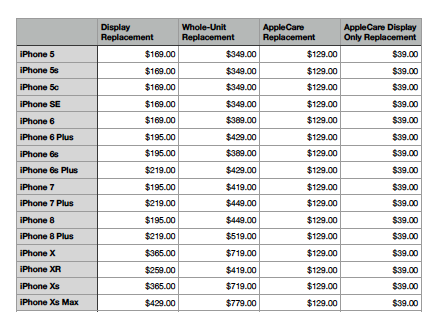 If you don’t have AppleCare+, your costs will vary. Jump+ uses only genuine Apple parts, which are critical to a quality repair. Using counterfeit and third-party parts can cause safety issues. We’ll test your iPhone to see if it has a battery issue or a different power issue. If your iPhone has a non-battery power issue, we'll give you the repair price after we determine the cause. 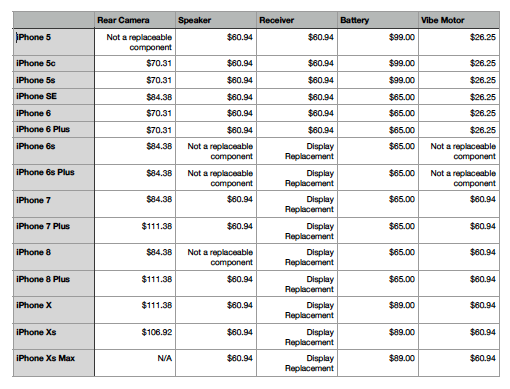 The repair pricing in this chart applies only to battery replacements. If you have any other damage to your iPhone, additional costs may apply. *Through December 31, 2018, the out-of-warranty battery service fee is CA$35 for all eligible iPhone 6 or later models. Battery service at CA$35 may be limited to one repair per iPhone. After December 31, 2018, the fee will change to CA$65 for all these products except iPhone X, which will change to CA$89. 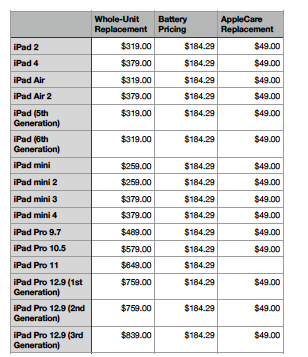 Our Apple certified technicians will examine your iPad and determine if it needs repair or replacement. Our Apple certified technicians will examine your Apple watch and determine if it needs repair or replacement.